There is an Earthshaker for sale near me. What would you say is a fair price? 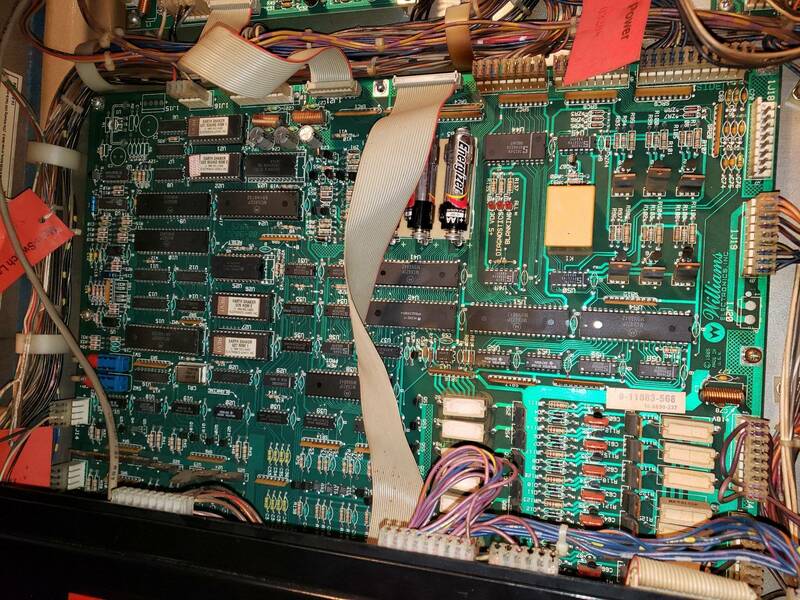 I dont know much other than the owner had it in his home for 16 years, recently had 400 worth of service (including board work) and bought it at an auction. Dont know much about the game other than what The owner has stated and I can see in the pics. I'd start at 2k, look at the archive to get an idea what similar condition machines have been selling for. I'd estimate he picked it up for 1k or less at auction and even with the recent service he'd still be coming out ahead. I think that looks like a nice rxample of an original game. Those pf’s can blown out but this one looks very decent Mylar bubbling also common. The scratches on the pf glass are typical and if it bothers you this isnt too expensive to replace for a standard tempered glass version. Cosmetically i say its average to above average for an original. Good find. The backbox GI lights are def out. GI is a fairly simple circuit. 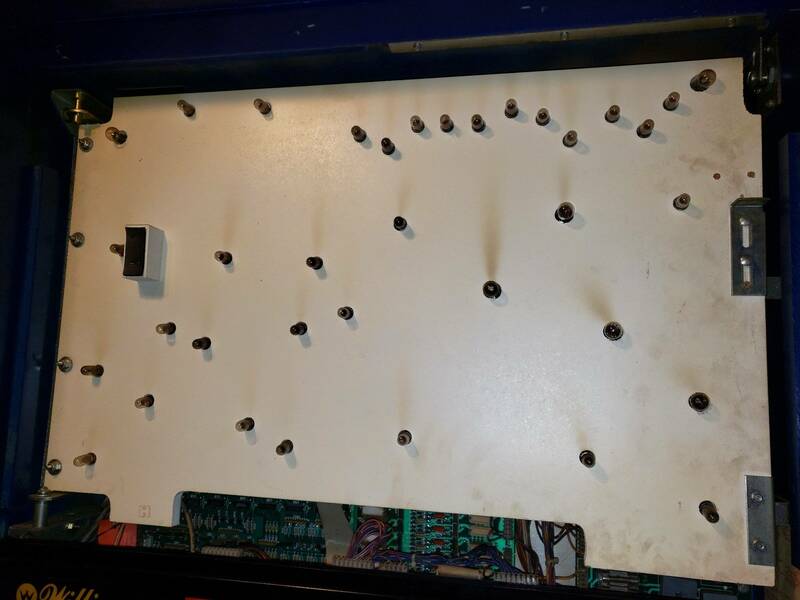 Look for a burnt connector on the bottom right side of the interconnect board. I’d pay 2k for that no problem and you’d never lose a dime on it. He also mentioned it does have a credit dot... is this possibly an easily fix or most likely not? SORRY, he said no credit dot. Also said the backbox lighting works. Hmm. I do agree it looks awfully dark. I’d ask for pics of the boards and also inside cab and under pf. Especially look at battery area for alkaline damage from leaking batteries. Didnt see at first but the top pic those displays look garlbed unless he just took pic at inopportune time lol. Pic was at bad time, I've seen other pics with display working. 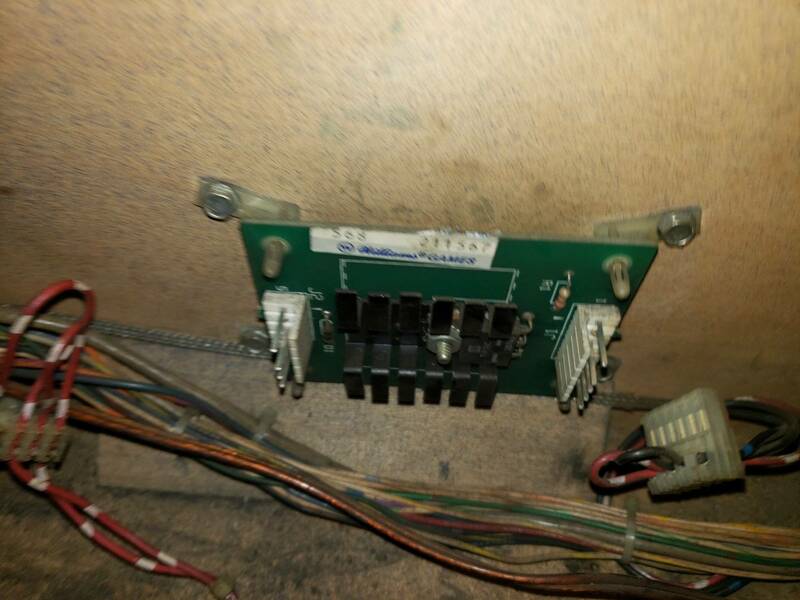 I agree on pics of boards, but not sure if he even knows how to open the backbox. I offered 1900 and he said ok. It is on first floor. Still think its a good deal then. Even if GI is an issue its a cheap fix. Just make sure if any alkaline hit the board it was (or gets) neutralized and cleaned up properly. But doesnt sound like it - if he paid someone who removed board and replaced holder you have to hope they didnt leave anything on the board. But i’d still take a closer look . 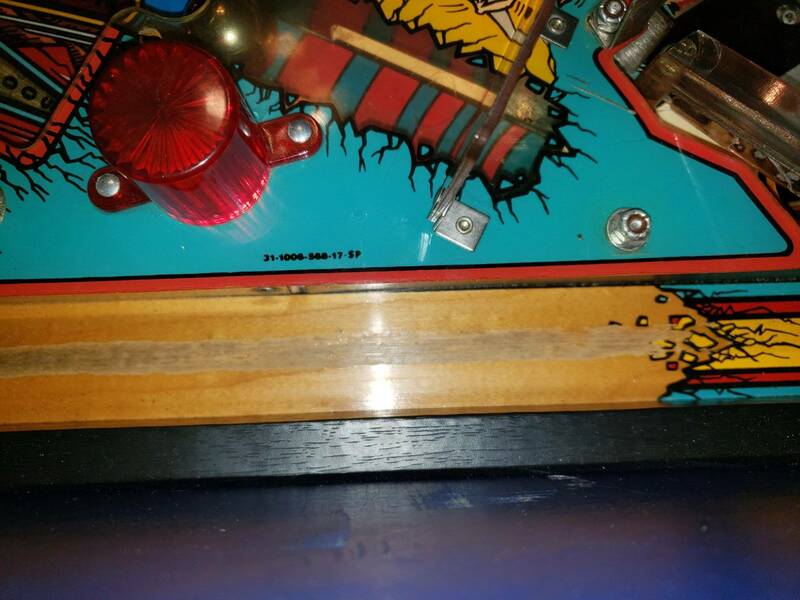 I grabbed my Earthshaker for 1600 in similar condition without a backglass. So I'd say $2k. 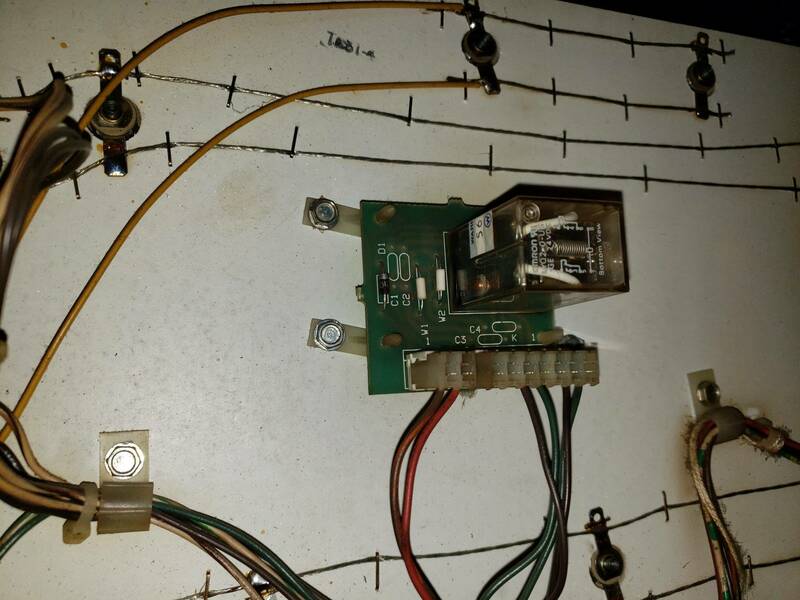 There is an interconnect board that fuses the GI circuits. My headers and connectors were crispy, repinned those to get my blackbox GI working. I felt daring and pulled my mylar using the freeze method and had fantastic results. Look like a nice example. Pop bumper caps aren't in the correct position but that's an easy fix. The game is specific to which color goes where. credit dots are on dmd games bally/williams. make sure the fault works, shaker, controlled gi, flashers. ES sell working and shopped and nice for 2k range, maybe $2200+ if lcd new display, new PS new flipper bats, rebuilt flippers, etc. people on here saying 2k as it sits is to high imo. you don't know what works and what doesnt and condition of boards etc. pix are terrible so cant tell. how are plastics to? Fair comment - but i don’t think anyone assumed that the OP wouldn’t go see the game and confirm everything infact works as described by seller before closing the deal and taking the game (at least i assumed this). Luckily he’s local and can check everything out in person. Personally i’ve never seen a sub 2k ES in recent history thats been fully shopped but that doesn’t mean they don’t exist of course. I went to go pick it up yesterday. It's not perfect unfortunately not nearly as good as it looked in the pictures. 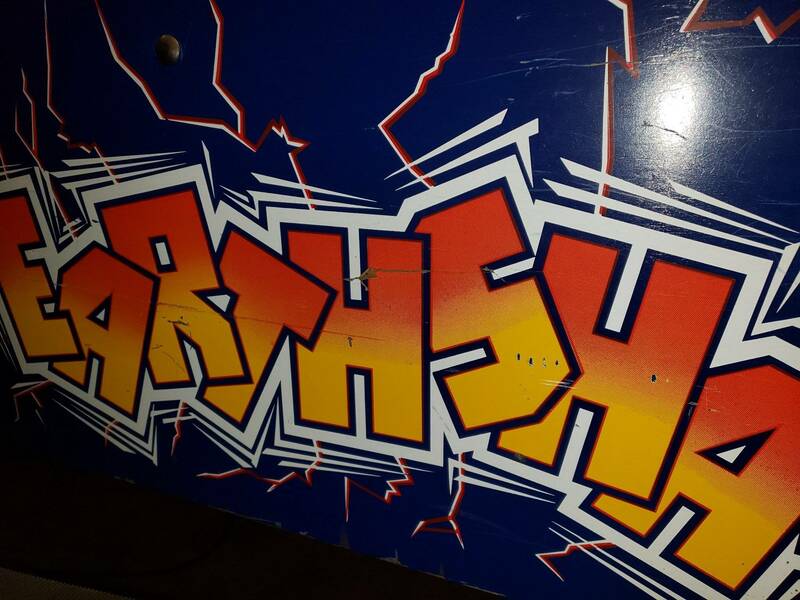 The cabinet Graphics have considerable amount of wear. There is a stripped lug bolt in the back left rear of the cabinet which I guess is not that big of a deal with the plates. There is some wood missing from that part of the cabinet but it's not too bad. There is also some damage to the left side of the cabinet to the point where I could probably flake off some wood in the middle of the cabinet. 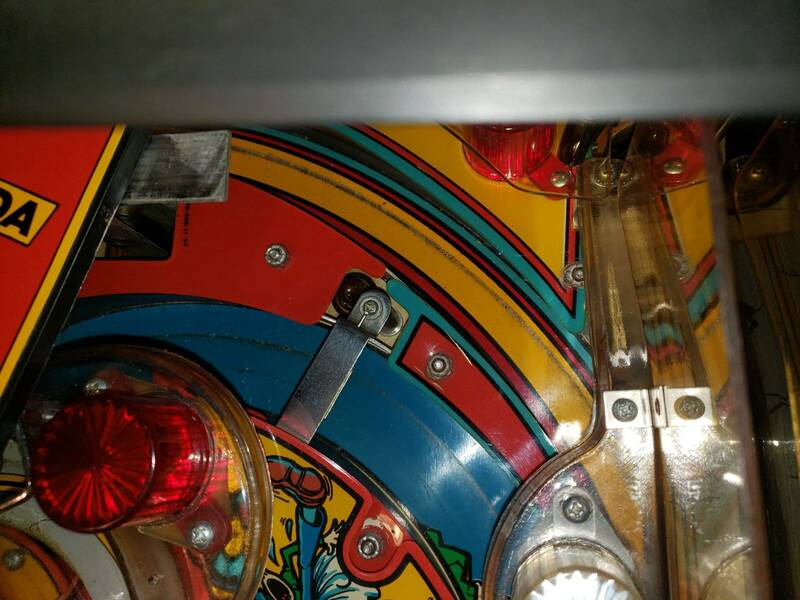 When I play the game at the guy's house I thought the fault didn't work, but it didn't understand that opens during multi-ball not at the start of multi-ball. Thankfully, the fault does open. 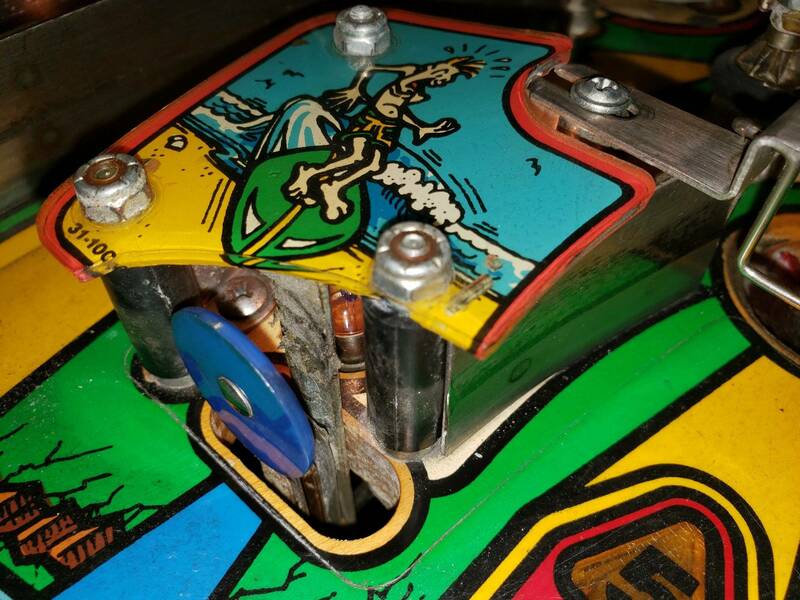 The Shaker motor does not work but when I lifted the Playfield I saw that two plugs on the left side near the Shaker motor are unplugged. 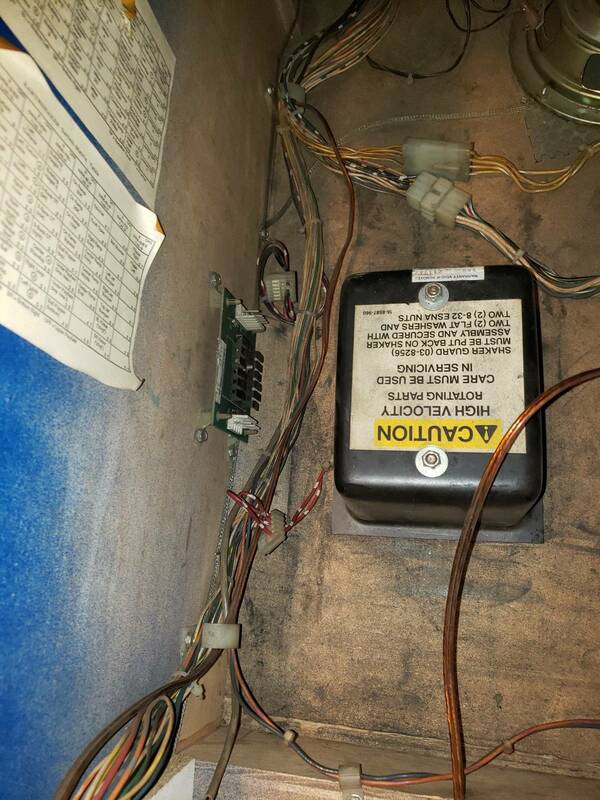 I need to figure out which fuses those coordinate to replace them if needed and then plug it in and see if it works. I'm nervous about just plugging it in without understanding this part. 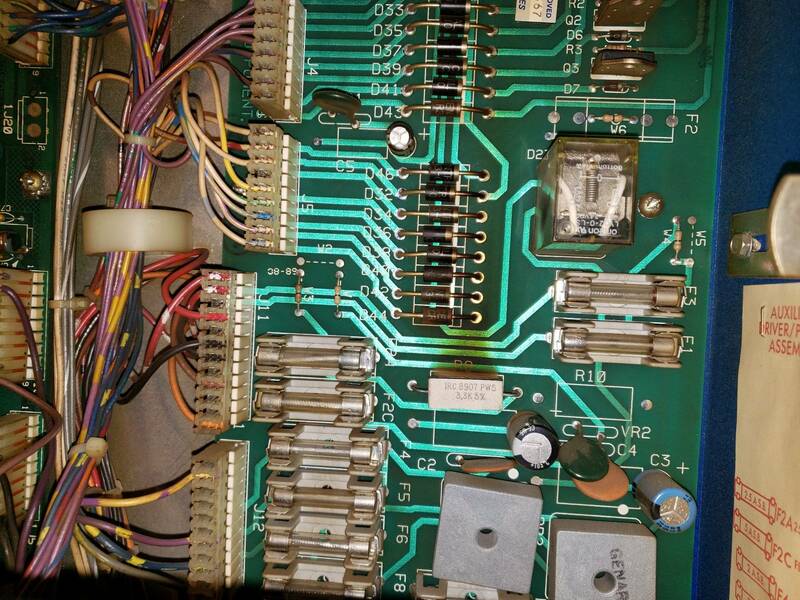 I do have two blown fuses in the lower left part of the upper right board. I'm too much of a noob to know what this board is called. Unfortunately there is some burn damage on a couple spots on the board. Last but not least the GI Lighting in the Playfield works but it Cycles on and off. Maybe about three seconds off and then it comes back on. When it Cycles on and off I can hear a relay clicking. Is it normal for these two Gray cylinders to be zip tied together? 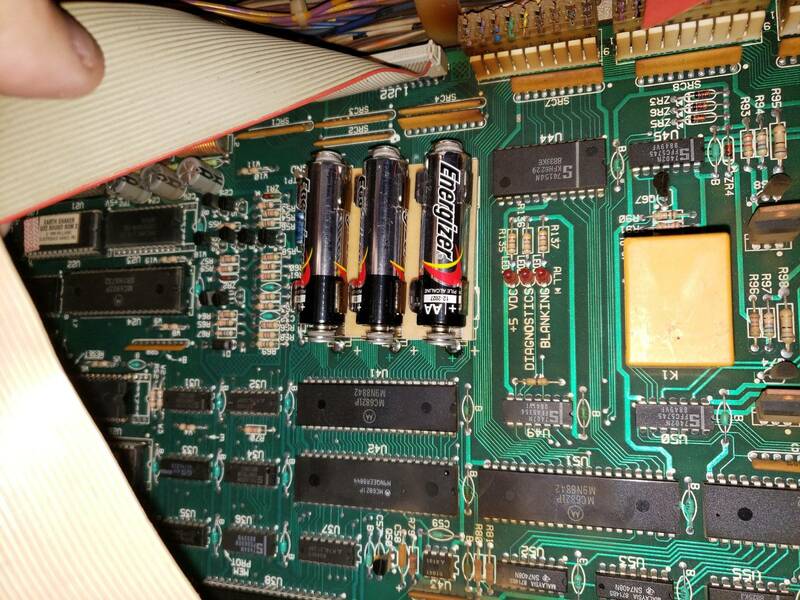 I think these are capacitors but honestly I have but honestly I have absolutely no clue. Just seems odd that they would be zip tied like this. The backbox GI lighting doesn't work but like I said above fuses F2 and F3 appear to be blown. I think he's fuses have something to do with the backbox GI so it might be as simple as a fuse. As you can see there does appear to be some burning on the backboard White part? There are some cracks in a few of the ramps, not surprising. The left flipper also frequently fails to go all the way back down. Could need a rebuild or maybe just a good cleaning no idea like I said I'm new and ready to explore these things but just not sure yet. just wanted to give you all an update. Maybe I overpaid maybe I didn't for 2019 dollars- I'm not sure. Either way I'm happy to have this game in my house and looking forward to working out the issues. 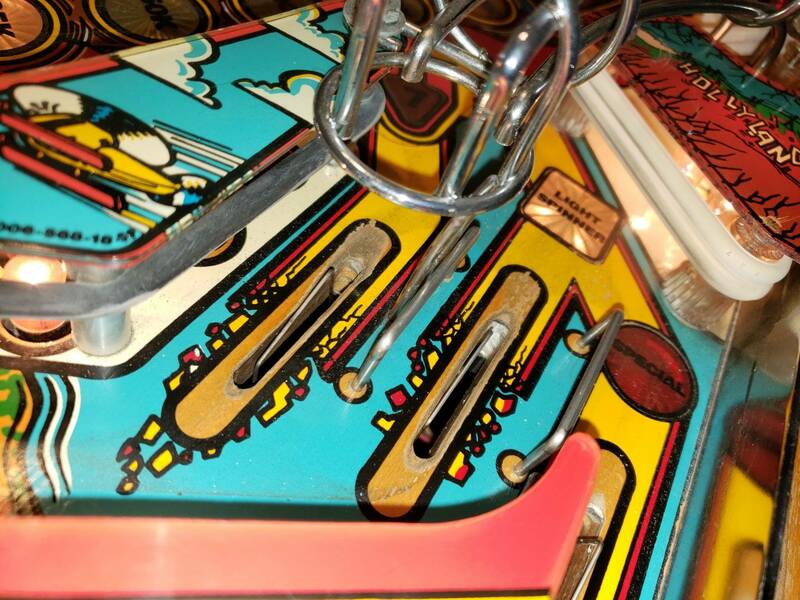 Playfield does have somewhere in a couple of areas. More than I could see from the pictures originally but it's not totally roached. It looks like mylar has been removed and reapplied and the original mylar was not really cleaned up very well. Overall, I'm still happy I got the game. 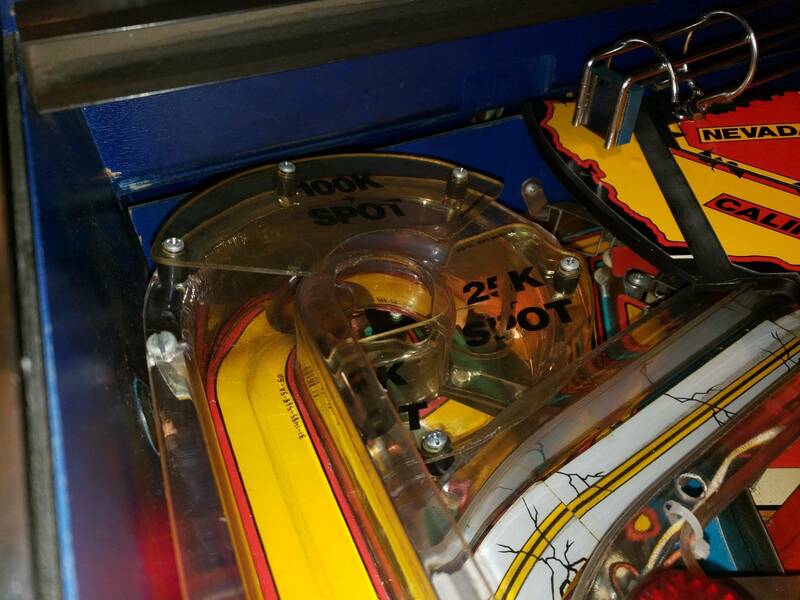 Let me know if you have any ideas on the gi playfield lighting cycling, if I should just plug the shaker motor in, and thoughts on the burn spots on the board and f2 f3 fuses. I took a picture of the relay board in blackbox because I'm thinking that's why the backbox GI lighting doesn't work. I think F2 and F3 fuses might be related so that probably doesn't help either LOL. Plugged the shaker motor in and ran through tests. It worked but was weak. Played the game and it came to life! Sweet!!!!! - gi lighting cycles during attract mode, works fine during play. (Is this normal)? - pictured blue target is pretty roached but it works. Yellow circle target is missing/ gone but the switch functions. 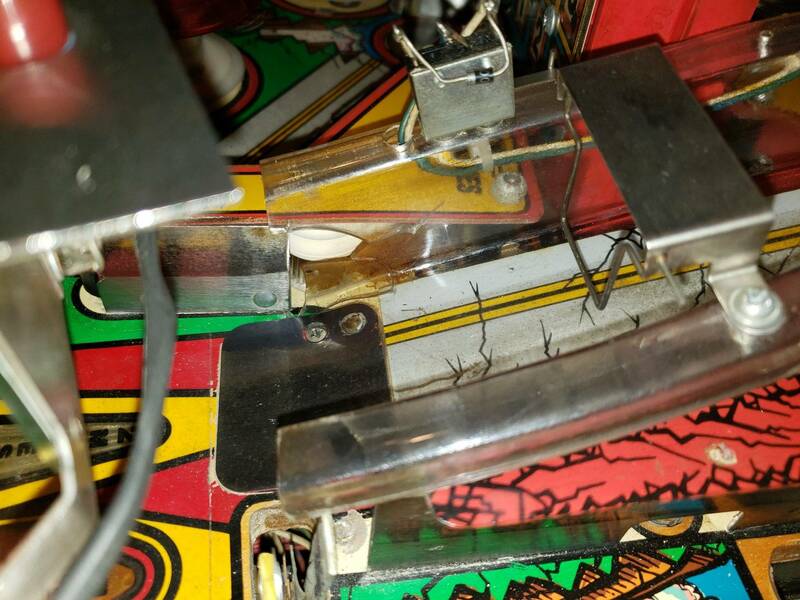 - left flipper needs a rebuild... stick with sys 11 or order new fliptronic assemblies from pinball life? -more playfield wear than I expected but not that bad overall I suppose! In the pics above, the "new" mylar goes around my thumb while you can see the grime line from old mylar. Based on prices around here, you got a good deal. I looked at one recently and it was way worse than what you are seeing, with major cabinet integrity issues, GI problems, a shaker problem, a sticking fault, and it sold for 2K. Enjoy! There is a setting in the adjustment menu for the strength of the shaker motor. I think Arcade is the strongest setting. 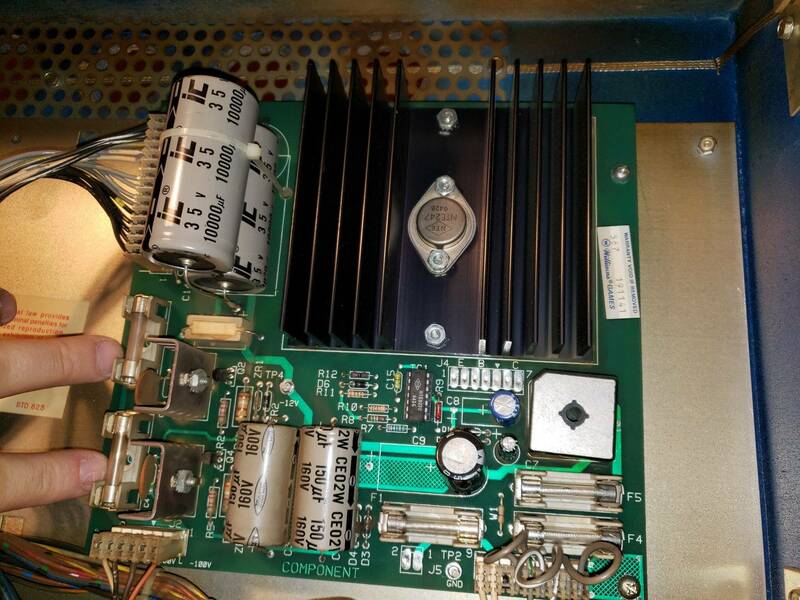 That cap on the power supply is unique - usually just one cap ziptied to the board (18,000 uf 16V). Looks like they didnt have a large enough one so doubled up a 10k. Ed from GPE sells a 18,000uf 25V cap for that location in his rebuild kits - increasing voltage rating is fine, but should stay the same in uf value. Thanks for your reply completist. I think you're saying to pull that board and replace the two 10k caps with the proper one. I'll check into that and learn how to do it. I saw the shaker motor settings in the menu but hadn't messed with it yet. It definitely does work just find even now. You can get rebuild kits for 25 bucks which will absolutely improve the gameplay. At the very lest you will want a new coil sleeve and coil stop and i change EOS switch while im in there. 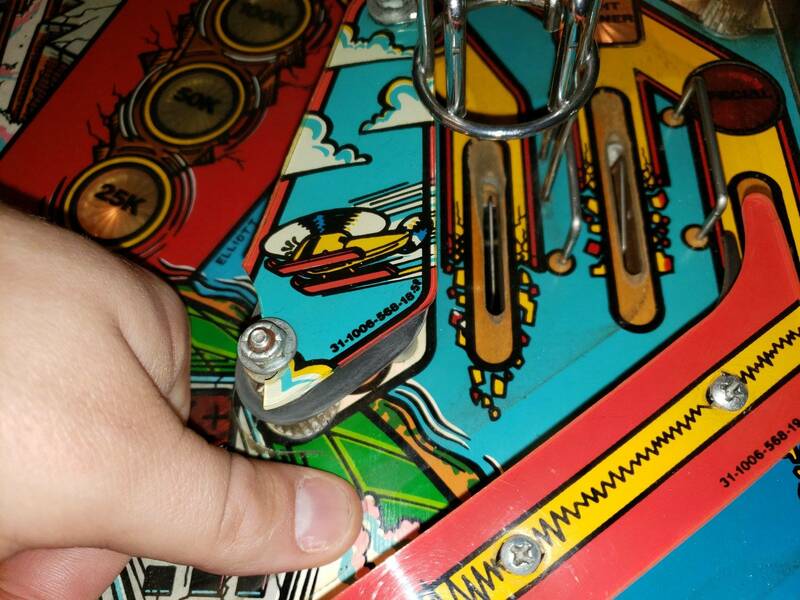 Also check / clean the flipper bushing that goes through the pf and make sure its not cracked or broken. The upgrade to the wpc version is good - makes them much snappier which Vid and others recommend.